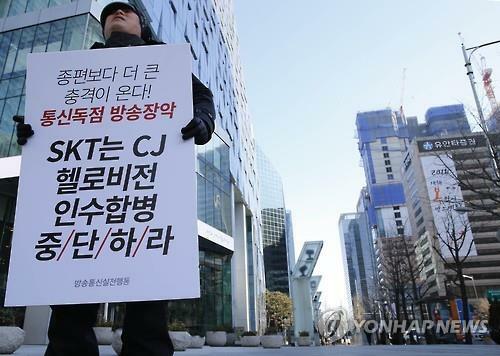 SEOUL, April 11 (Korea Bizwire) – In a rare joint publicity stunt, South Korea’s two smaller mobile carriers placed an ad in 29 major newspapers late last month to denounce industry leader SK Telecom Co.‘s push to buy the country’s top cable TV operator. “We request that SK Telecom give up on a harmful acquisition and merger,” read the front-page advertisement run by the No. 2 player KT Corp. and the bottom-dweller LG Uplus Corp., referring to SK Telcom’s move to acquire CJ Hellovision Co. and merge the firm with its wholly owned subsidiary SK Broadband Co.
“SK Telecom’s injurious M&A will make South Korea’s communications infrastructure go backward, enable the company to reap huge profits at the expense of clients and result in massive job losses,” KT and LG Uplus claimed. It was not the first time for the two mobile underdogs to place a critical ad. They put similar ads in the 29 newspapers for two straight days in mid-March, questioning SK Telecom’s real motive for the acquisition. The ad blitz is a graphic reminder that their months-old conflict has now come to a head pending a regulatory ruling on SK Telecom’s 2015 deal to take over CJ Hellovision, also the country’s top provider of Internet TV content. It is also seen as the duo’s last-ditch efforts to tilt public opinion in their favor ahead of the government decision on the deal, which they argue would cement SK Telecom’s grip on the mobile communications and pay TV markets, thus creating an unlevel playing field. SK Telecom is now awaiting regulatory approval from the FTC, the Korea Communications Commission and the Ministry of Science, ICT and Future Planning. The FTC, South Korea’s antitrust watchdog, had originally planned to complete its deliberation by the end of March but has delayed its decision due to a need for more deliberation, forcing SK Telecom to delay the date of the merger from April 1. After consultation with the FTC and the communications watchdog, the ministry is expected to make a decision soon. KT and LG Uplus have been locking horns with SK Telecom since early November, when the leading mobile carrier signed a 1 trillion-won (US$864 million) deal to purchase CJ Hellovision from its parent firm CJ O Shopping, a home shopping unit of food and entertainment conglomerate CJ Group, to merge it with SK Broadband. Dismissing the two carriers’ opposition as a mere ploy to scupper the deal, SK Telecom insists that the acquisition is aimed at increasing the parameters of its business and boosting its competitive edge, while injecting greater competition into the market. In a recent meeting with reporters, SK Telecom CEO Jang Dong-hyun lambasted KT and LG Uplus for throwing a wrench into its efforts to become more competitive. The takeover is widely expected to give a big boost to SK Telecom as an all-round media platform operator. SK Telecom’s share of the mobile market nears 50 percent with slightly over 28 million users, while KT and LG Uplus trail with some 30 percent and 20 percent, respectively. But SK Broadband, SK Telecom’s cable and Internet TV service unit, accounts for only some 10 percent of the pay TV market, lagging far behind that of its bigger rival KT. 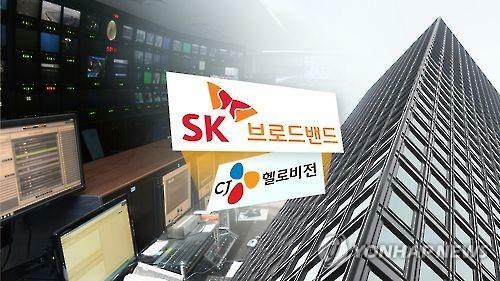 Once the merger between SK Broadband and CJ Hellovision with 4.16 million cable TV subscribers is completed, SK Telecom would boast 7.7 million broadcasting service subscribers, which could put the company in a better position to compete with KT. Currently, KT is the top player in the pay TV segment with 6.15 million users of Internet Protocol TV services, along with 2 million subscribers to KT Skylife Co., a satellite broadcasting provider. LG Uplus has around 2.2 million users of its broadcasting services. KT, also South Korea’s top fixed-line operator, argues the envisioned merger would distort the market order as SK Telecom’s dominance of the mobile network industry may spread to the broadcasting segment as well. Over the past months, KT CEO Hwang Chang-gyu has seized every opportunity to call on the government not to give the go-ahead to the deal. “If the government makes a wrong decision now, South Korea’s communication industry will have no future,” said Hwang, who served as the president of Samsung Electronics Co.’s semiconductor business division from 2004 to 2008 before taking the helm at KT in January 2014. 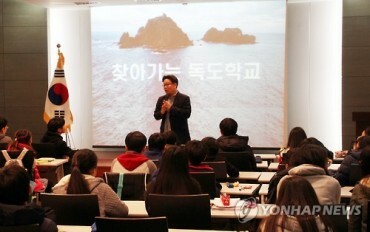 LG Uplus, the mobile arm of South Korea’s No. 4 conglomerate, echoes KT’s concern. “SK Telecom could monopolize the broadcasting and telecom industry, so the illegal merger should be blocked,” a company official said. KT and LG Uplus also contend that they will be no match for SK Telecom if it comes up with a bundled product combining pay TV, broadband and fixed-line services, capitalizing on its dominant position in the mobile market. Adding a new wrinkle to the sometimes nasty wrangling, a global corporate advisory company recently threw its support behind KT and LG Uplus, following in the footsteps of local civic groups, labor bodies and broadcasters. In a report to clients, U.S.-based Institutional Shareholder Services Inc. (ISS) said in late February that it is opposed to the proposed merger between SK Broadband and CJ Hellovision, claiming it may bring more harm than good to the latter’s shareholders. “The concern lies with the proposed changes to the merged company’s articles of incorporation, which, if approved, would enable the board to issue convertible securities in excess of 20 percent of outstanding shares without shareholders’ approval,” said the ISS, which advises global hedge funds and institutional investors shareholder votes. In mid-February, the People’s Solidarity for Participatory Democracy, one of the leading civic groups in South Korea, submitted a written opinion to the ministry that opposes the controversial deal, saying it would clear the way for SK Telecom to tighten its grip on the communications market. Expressing strong opposition to the acquisition, domestic labor groups argue it could lead to large-scale layoffs. TV stations are also adamant against the takeover, saying it would enable SK Telecom to become a major player in the broadcasting market. Local analysts are divided over the impact of SK Telecom’s acquisition of CJ Hellovision. Korea Investment & Securities Co. said the takeover would lead to a great synergistic effect for SK Telecom. “The takeover and subsequent combination with SK Broadband would contribute to expanding its revenue by increasing the number of broadcasting and broadband subscribers and boosting its fee incomes from home shopping,” Yang Jong-in, a researcher at the brokerage, said in a recent note to clients. In a negative take on the merger, SK Securities Co. argued it may not foster competition in the pay TV market and help lower subscription fees as claimed by SK Telecom, given the current upper limit on market share. South Korean law bans the market share of a single pay TV operator from exceeding 33.3 percent. The merged entity between SK Broadband and CJ Hellovision would reach 26.5 percent, compared with KT’s 30 percent.